Unless you have been to my house, you do not know how signifigant this picture is. As soon as I sent it via text message to my close friends, they were in disbelief. My dresser (hell, my whole room) is always a disaster area. It is the catch-all of the entire house. 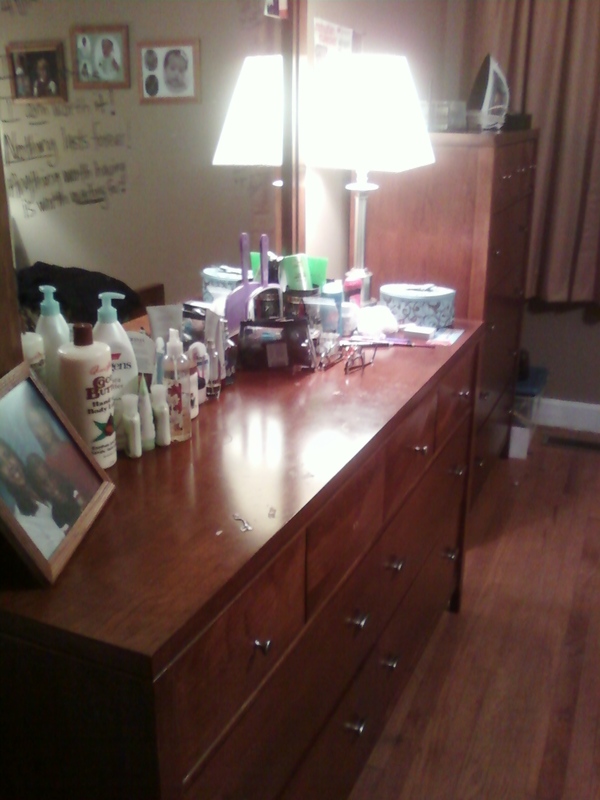 Even when my room is clean, though, my dressers are never cleaned off. This dresser is usually piled so high that you can't see the surface at all. Kind of like I let the clutter in my head? Maybe. Today, I woke up and decided first thing that no matter what, this was going to be a good day. My heart is still heavy over a situation I am dealing with. But I took charge of my thoughts and my well-being first thing this morning and guess what? It worked! I still have peace, and I'm still feeling good. I was having a good hair day and I snapped a picture (yes, I know, kinda cheesy). But I just stared at the picture on my phone for a while and decided that it is not bad. I am not loving that picture (yet), but I didn't hate it. I accept that it is me right now. 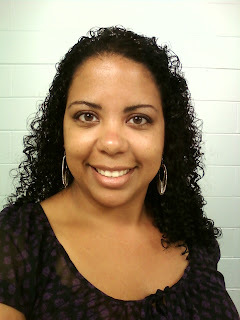 Yes, my face is fatter and I can tell that I have gained weight, but that is just who I am and I have to move forward. I can't get caught up in how much I wish I looked thinner. After I emerged from my bedroom, it was like I looked at my whole house through new eyes. What looked clean didn't really cut it anymore. I have not only let myself go. I have let my house go, too. My standards are definitely lower than they were when I was married and my ex checked everything with white gloves, lol. But I didn't think I had slipped that far. I mean, it's not NASTY or DIRTY - just messy. Yeah, I do have three kids and this is a small house, but I know I can do better. And the time is now. I didn't sleep well at all last night, so I am off to bed. I even have my clothes picked out and ironed for tomorrow! I am aiming for a smooth morning so I can do my hair and makeup again. That made me feel better today. I just want to keep this feeling I have - the peaceful feeling that has eluded me for so long. I am not ready to give it up just yet - if ever. It sounds like you are working hard to help your brain make a shift towards peace. I think it will be the best way to help you, to help me, to help us all. Excellent de-cluttering, by the way! Nice job on the dresser and your hair! You are a beautiful woman, Hollie..on the inside and out. You are an amazing and loving Mom. And, you are now the resident of a really gorgeously clean bedroom! You are incredible. You deserve the best! not cheesy at all I LOVE LOVE LOVE seeing you shoutout to yourself, Woman. I'm very proud of you, I know how hard that must of been just to get started but you did it! I believe your surroundings also affect how you feel. So i know you must feel so much lighter and free. it's like cleaning the soul. Enjoy your day pretty lady. De-cluttering my home is always helpful as well. When I find I have let things go in the house it also normally indicates I'm getting lax in other areas as well. You hair looks pretty good! You look beautiful Hollie. I hope the peace remains you deserve it. de-cluttering is the best feeling ever! For me, it's the kitchen counter. It gets everything -- mail, crap spilled from my purse, things to remember, things I don't know where to put, etc. It's gross. Having a clean counter puts me instantly at ease. Enjoy your de-cluttered space! Good hair makes any day better!! I've totally lived in a messy (NOT dirty) house my whole life. It's so refreshing when you can see a counter or the floor. Keep up the good work!! Good job! I know just the feeling. My standards have slipped a little over the last few years too. I think kids and their messes will do that! And I am now just getting back to "me" and getting things in order. There is just something amazing about cleaning and then looking to see your "accomplishment" right? Good job! Good for you! Not only did your dresser look great, so did the picture you included of yourself. You are so pretty! Thought you should know! I completely relate. I have SO much clutter. It is definitely time for a de-cluttering in my house (and my life)! Good on you. I have been there myself and found the tools on http://www.flylady.com/ helped me get under control and my house organized. check it out. It really does work. Isn't it amazing how getting the clutter out of our life makes everything easier? I've noticed that the cleaner and more clutter free my house it--the more I accomplish everyday. I just started my own weight=loss journey blog and since I have nver blogged before I am out in the world wide web checking out other people's blogs. Can't wait to see your success. BTW...I got a blog award!